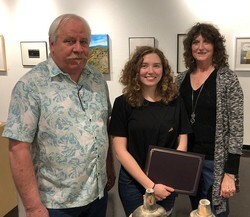 David Cozadd, president of the SFA Friends of the Visual Arts board, and Linda Mock, FVA scholarship committee chair, present the Robert Kinsell Art Scholarship to Chloe Garrett, a sophomore art student from Orange. NACOGDOCHES, Texas - Chloe Garrett, a sophomore art student from Orange, is the newest recipient of the Robert Kinsell Art Scholarship awarded by the Friends of the Visual Arts at Stephen F. Austin State University. Garrett's primary focus is painting. Assistant art professor Shaun Roberts nominated her for the award. "Chloe is a highly motivated and gifted student," Roberts said in his nomination letter. "Although she is still early in her academic artistic career at SFA, Chloe is already producing high-quality results. She continues to enthusiastically absorb what we cover in class and readily accepts and gives constructive comments in critique. She sets the bar for the other students in the classes." Roberts also described Garret as "a talented, driven young artist." "I look forward to her presence in future classes of mine," he said. The SFA Friends of the Visual Arts established the Kinsell scholarship to support the educational goals of students currently enrolled in the School of Art by providing financial assistance to outstanding students in the visual arts program. The scholarship also honors Kinsell as a teacher, as an ardent supporter of the arts in the Nacogdoches community, and as a huge supporter of the FVA and its fundraising activities. An art professor at SFA for 25 years before retiring in 2013, Kinsell taught courses in painting, drawing, figure drawing and advertising design. The Robert Kinsell Art Scholarship is awarded annually to an undergraduate or graduate level art student with painting or photography as his or her major study area, according to the criteria developed by Kinsell. The SFA Friends of the Visual Arts is made up of community members who support the arts in East Texas and provide monetary assistance to students enrolling in the School of Art by conducting fundraisers, such as the upcoming annual 12 x 12 event in July.